This is Eldest, eating ACTUAL FOOD. She talked me into this tonight. 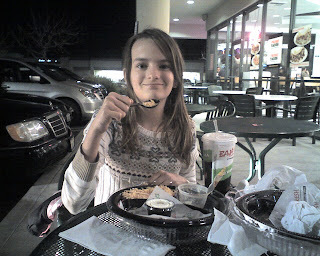 The middle school was having a Baja Fresh / Coldstone fundraiser tonight. "But mommy," Eldest said, in her best 'I am about to use your own words against you' voice. "You SAID you would do the next fundraiser onceyou had a paycheck..."
Sigh. She runs rings around me logically. Also pretty darned cute. The way she wrinkles her nose and giggles when her victory is complete? Adorable child. Clearly very intelligent. Are the two of you eating OUTSIDE in February?! ?